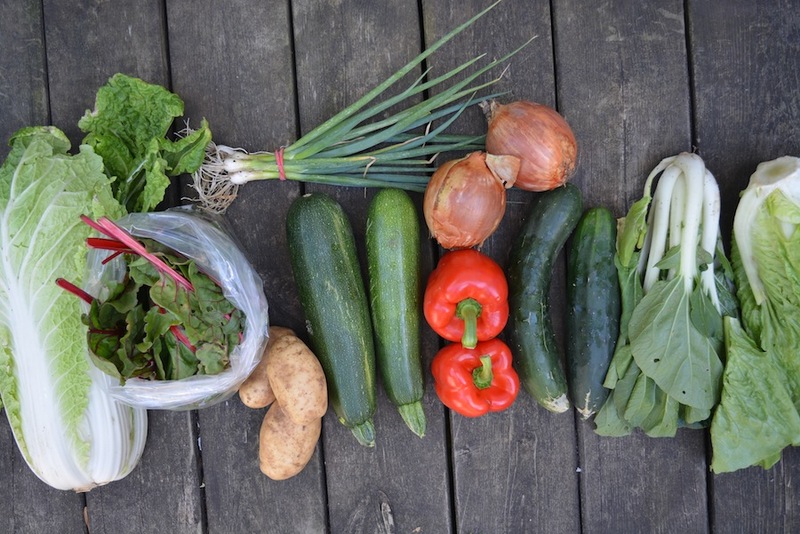 Weeks 7, 8, 9, 10 and 11 Community-Shared Agriculture (CSA) Boxes – Ashleigh Grange, R.H.N. 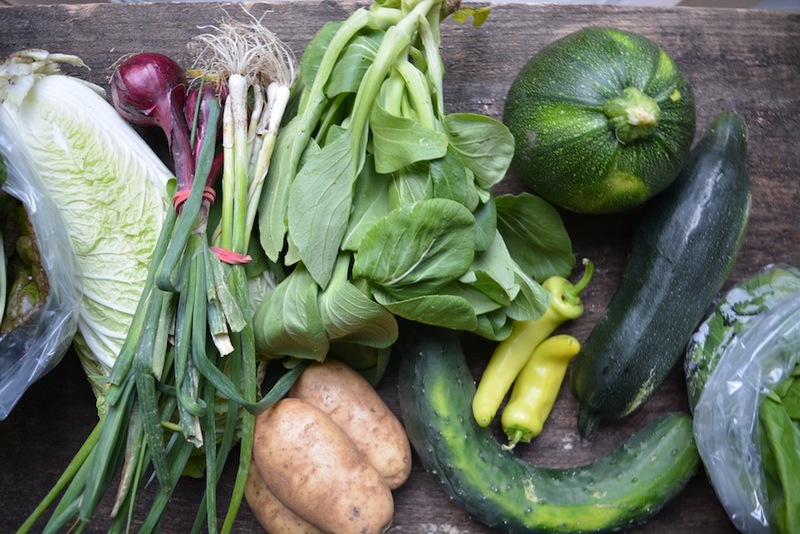 You may have noticed that the series seemed to stall at Week 6… unfortunately I found the CSA boxes quickly became repetitive and it was only at weeks 10 or 11 that things started to get interesting again with all the warm-weather foods arriving! That’s the nature of the seasonal eating beast, though. 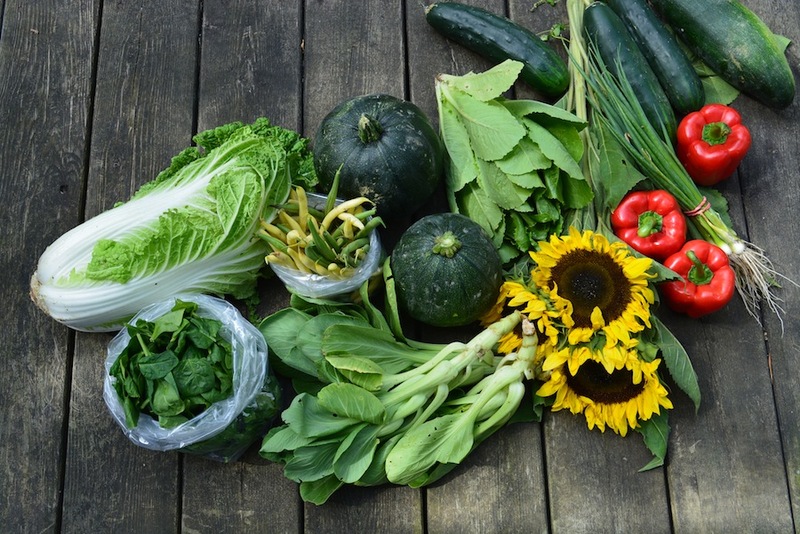 When you choose your foods based on what’s growing locally in your area, you may end up eating a lot of what’s growing locally based on how plentiful the harvest is (zucchini, I’m looking at you). You may find that this challenge inspires your creativity in the kitchen… it does for me. Despite this repetition, I was still faithfully snapping a “group shot” of each week’s CSA box so I’m sharing them all with you today! Better late than never, eh? I’ll do my best to give you a condensed version so you’re up to speed. From top to bottom, left to right (mostly): Perpetual spinach, Napa cabbage, red onions, green onions/scallions, bok choy (surprised? neither am I! ), potatoes, zucchini, sweet peppers, cucumbers, spinach. From top to bottom, left to right (mostly): Napa cabbage, perpetual spinach, green onions, potatoes, zucchini, cooking onions, sweet peppers, cucumbers, bok choy (surprised?? ), romaine lettuce. From top to bottom, left to right (mostly): Napa cabbage, spinach, zucchini, green and yellow beans, bok choy (not surprised? ), romaine lettuce, sunflowers (great as a bouquet for the kitchen or office and they last forever), cucumbers, sweet peppers, zucchini. You’ll notice that this week’s picture looks rather different from the rest. I ended up picking up my basket early that week because I was heading to Chicago for a long weekend conference. 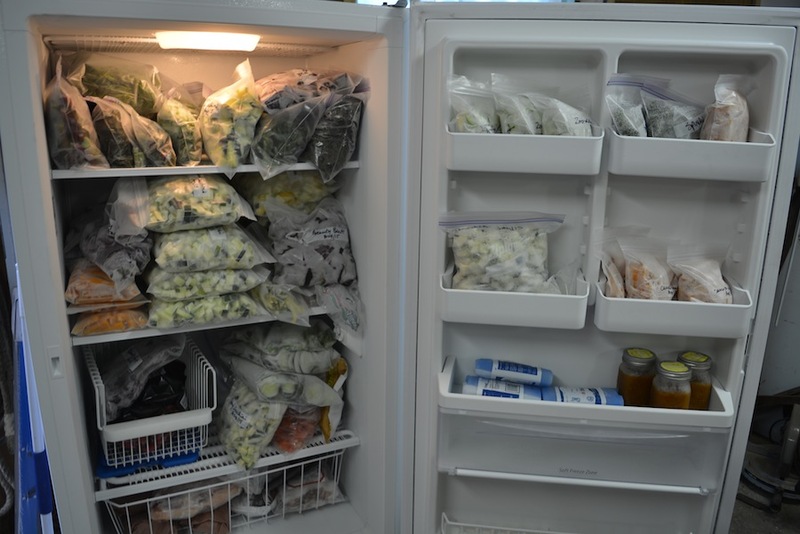 I prepped everything to go immediately into the freezer… safe to say, it’s pretty packed. I also bought carrots, beets and zucchini in bulk the week before so a lot of those veggies were prepped for winter eating/stew making/stir-fry eating. And in case you’re wondering, the zucchini bulk buying wasn’t on purpose. The truth is, I was at the produce auction in Elmira, Ontario, and no one wanted the zucchini. Imagine. It’s not that no one ever wants the zucchini, it’s just that no one wanted it that day. And if the zucchini doesn’t get sold, then the farmer doesn’t get paid. So, the auctioneer asked (begged?) if anyone would take pity on the lonely zucchini. What can I say, I’m a sucker for a sad vegetable story… so I bought two half-bushels of zucchini (equivalent to about 40 lbs.) for $4.00. I’ll be eating zucchini until next July. From top to bottom, left to right (mostly): Organic peaches & cream corn (YUM! 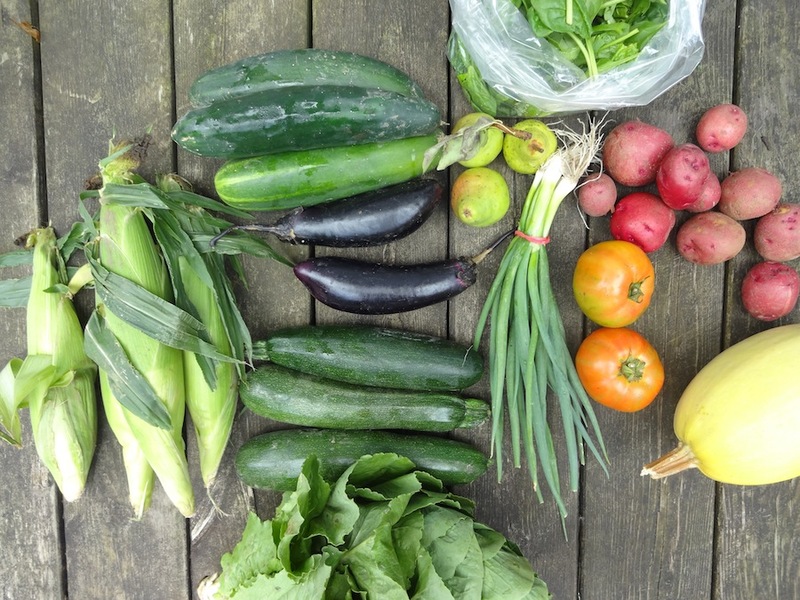 ), cucumbers, eggplant, zucchini, romaine lettuce, spinach, pears, green onions, potatoes, tomatoes, spaghetti squash. Cooking tomatoes slow and steady is one of my favourite things to do, especially when I have plans for them to become tomato jam. Here’s a recipe for my Sweet and Spicy Tomato Jam. I can’t even tell you how good and how versatile this is! I also love roasting tomatoes just because or just for this recipe. Within the next week, I’ll also be sharing a peak at a Smoked Tomato-Pear Jam I made yesterday in the Week 12 CSA reveal. If you prefer ’em raw but have a pile you need to take care of, salsa is always in style and this recipe for Tangy, Refreshing Red & Green Salsa freezes superbly. Butternut squash: So far we’ve only had spaghetti squash in our boxes, but if you have butternut squash in yours, you might love to try this Butternut Squash and Swiss Chard Lasagna. I find lasagna time-consuming to prep so I don’t make it often but I love using vegetables in place of noodles (see my Chicken Pesto and Zucchini lasagna here). Many of the same familiar faces until week 11, so you may want to revisit some of my earlier CSA posts. Coming up soon watch for a detailed rundown of the Week 12 Box that I picked up yesterday with more food info, recipe ideas and clever kitchen tricks! This entry was posted in Local Food and tagged bok choy, community shared agriculture, community supported agriculture, corn, cucumber, edencrest farms, eggplant, farm share, food share, green beans, green onions, local food, Napa cabbage, onions, organic food, pears, perpetual spinach, potatoes, romaine, seasonal eating, seasonal food, spaghetti squash, spinach, sunflowers, sweet pepper, tomatoes, yellow beans, zucchini.